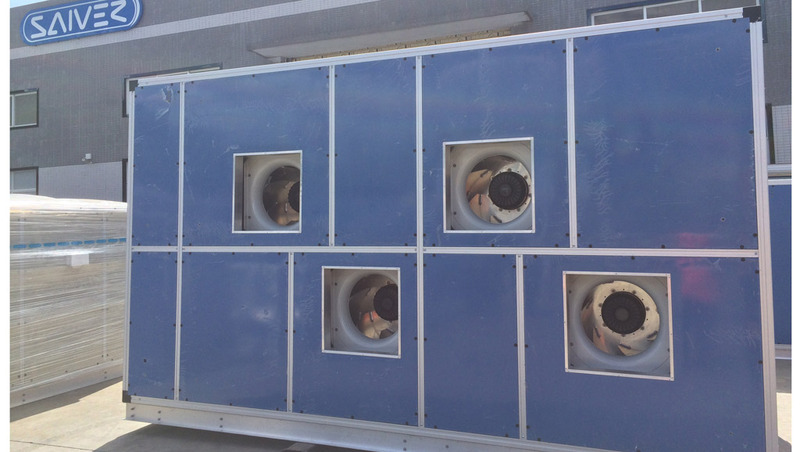 In a gigantic new casino complex in the Chinese city of Macao, 1,100 RadiPac fans from ebm-papst ensure good air – efficiently, quietly and reliably. Many millions of visitors come to Macao not only for the many historic buildings dating back to the Portuguese colonial period. More than 30 casinos also make the city in the Pearl River delta a popular destination. So that the guests are not only well entertained but also feel thoroughly comfortable, the operator of the casino contracted the company Saiver to plan the air-conditioning system of the complex, which is open for business around the clock. The heart of the complex is a half-scale replica of the Eiffel Tower complete with three visitor platforms. Saiver is a globally operating manufacturer of air handling units (AHUs). The company has entered a joint venture for the Asian market with Welcome Air Tech Ltd., a HVAC equipment supplier based in Hong Kong. Together they designed and built a total of 350 AHUs for the large-scale project in Macao, which not only ensure the supply of fresh air to the building but also regulate the temperature and humidity inside. For the air conditioning, 1,100 RadiPac EC fans from ebm-papst were installed; they circulate more than 12,000,000 cubic meters of air per hour. ebm-papst specially designed the centrifugal fans of the RadiPac series for use in air conditioners and ventilation units. The requirements for air conditioning in this project are complex. From the hotel rooms and stores to the giant reception hall and the theater, the requirements for air conditioning vary from place to place. Tailor-made solutions were developed and the units were adjusted to the specific conditions. From the hotel rooms and stores to the giant reception hall and the theater, the requirements for air conditioning vary from place to place. Three different RadiPac models are used for the ventilation units: size 310 with an air flow rate of 5,000 m³/h, size 450 with an air flow rate of 10,000 m³/h and lastly size 630 with an air flow rate of 20,000 m³/h. The AHUs were completely prefabricated in China and therefore easy to install on site. This saved time at the construction site and meant lower costs for the builder. The RadiPac EC fans permitted lean production at the customer’s end; they are designed for plug & play installation. It was important to the casino operator to maximize the usable space in the building, so space-consuming equipment rooms had to be avoided wherever possible. Thus, a lot of performance had to be accommodated on little space. The engineers designed the AHUs so that they can be mounted on platforms in the ceiling and docked directly onto air distribution ducts. For this type of application, the otherwise commonly used belt-driven fans were unsuitable, primarily because the design principle of this drive form requires a relatively large amount of space: variable frequency drive, motor, belt drive and fan are each installed individually and separately. It was important to the casino operator to maximize the usable space in the building. This is different with the RadiPac: electronics and motor form one unit, which saves space and also enables easy installation. An integrated control electronics system replaces the external variable frequency drive and, as the electronics and the motor are ideally matched to each other, additional electronic filters and shielded cables become superfluous. This way, the length of the ventilation units could be reduced. 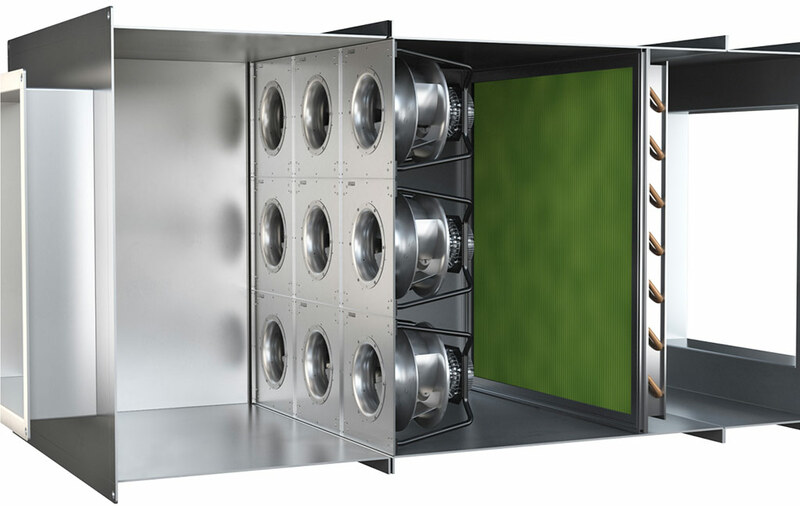 In spite of their more compact design, the AHUs had to be powerful enough to move the air under sufficiently high pressure through the air-conditioning ducts, some of which extend over three stories. Depending on where the fans are used, air flows of up to 80,000 m³/h are required. Saiver therefore relied on FanGrids with up to six RadiPac EC fans arranged in parallel. 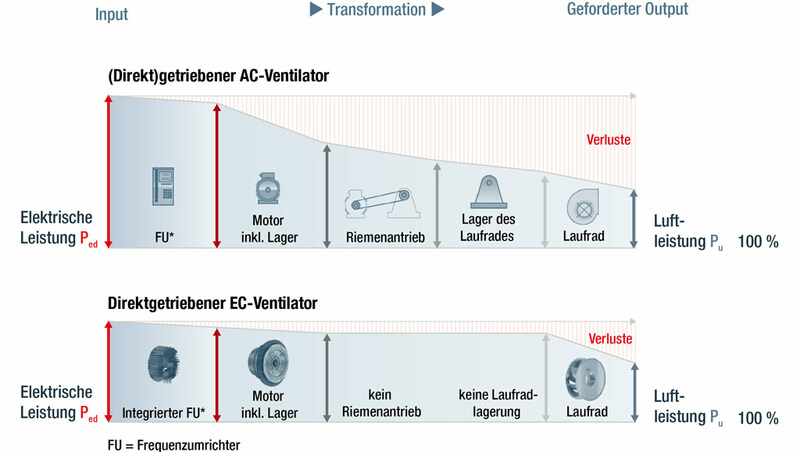 The parallel operation of multiple small fans has huge advantages over large individual fans in ventilation technology. The even flow through the heat exchangers or filters leads to better heat transfer performance and more efficient filtering of the air [Figure 4]. In addition, several small fans require much less space, which reduces the costs of the system. The fans use EC motors with an external rotor design, i.e. grid-fed, permanently energized, synchronous motors with electronic commutation, also called BLDC (brushless DC) motors, which boast efficiencies that are far above efficiency class IE 4. They work much more efficiently than a fan driven by an asynchronous motor via belt. Belt-driven fans also have the drawback that they are relatively high-maintenance and break down as soon as just one component fails. If the only fan breaks down, this in turn means a complete failure of the ventilation system. The fans use EC motors which work much more efficiently. Not only can this be unpleasant for guests because of the rising temperatures, it can also become dangerous quickly if the CO2 concentration in the air increases in consequence. So that the required air volume is provided in the building at all times, the FanGrid was laid out redundantly. This parameter specifies how many fans can be switched off without dropping below the required air flow. The most powerful unit manages to move 80,000 m³/h against 1,500 Pa – with great energy efficiency thanks to EC technology. Hotel guests as well as visitors to the theater and casino not only appreciate the good air quality, they also gladly do without the disturbing noises. 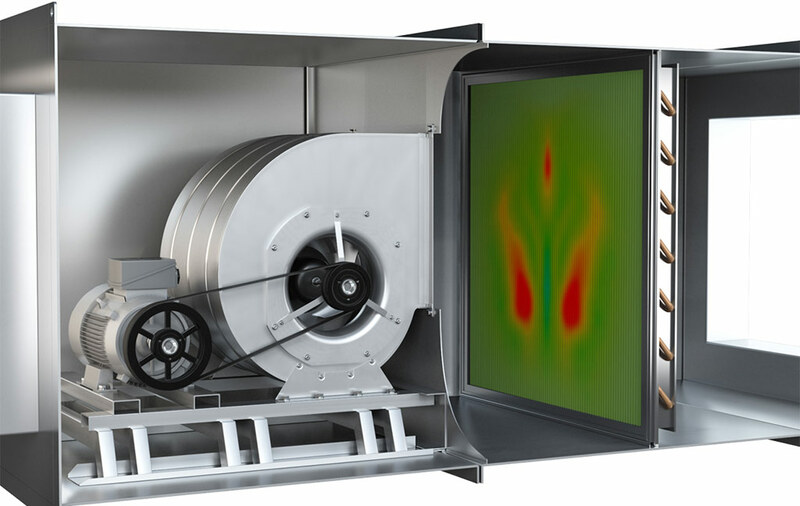 The RadiPac EC fans score over the belt-driven fans in this aspect as well. They are much quieter, especially at low speeds. This is due to the commutation and the stator design in the EC motors, which ensure low-noise magnetization of the main field. Thanks to the MODBUS interface in the EC motors, they are ideal for integration in Building Management Systems (BMS). 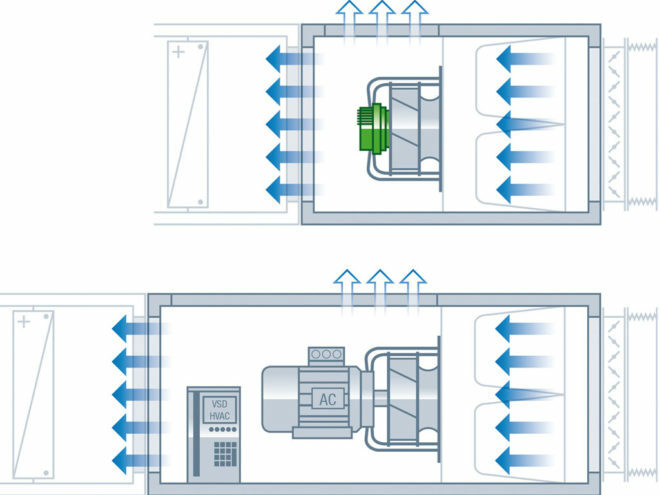 The operator can also monitor the energy consumption and speed of the fans remotely.